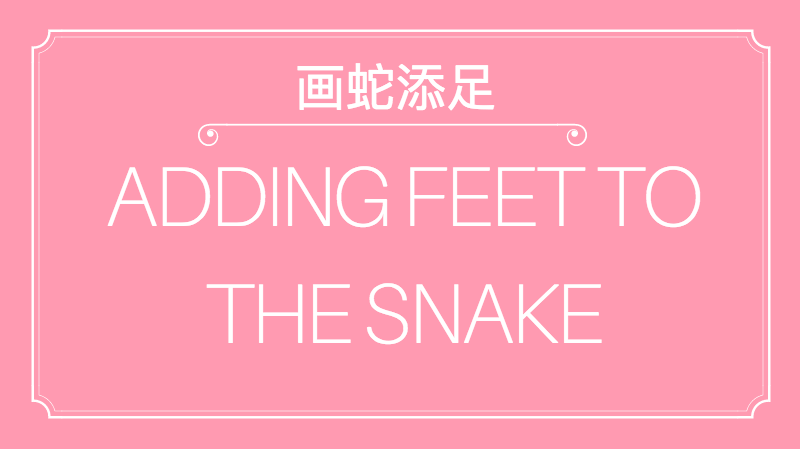 This long-awaited idiom is called "Adding Feet to The Snake." In Chinese it is called Hua She Tian Zu 画蛇添足。What does it mean to add feet to the snake you ask? Well it means you are adding more than necessary. Because everyone knows snakes don't need feet! Even if you give snakes feet...they won't know how to use them! * This is one of my favorite Chinese idioms aka Chengyu. From now on, if I use the term "Chengyu," please understand that it is interchangeable with "Chinese idioms." Long long long long time ago, in the Hegemonic state of Chu (during the Zhou dynasty circa 260 BC) there was a family paying respects to their ancestors. After the tribute, the master of ceremony took out a bottle of wine to share with other members who came to pay their respects. There was too little wine to go around. So, they decided to come up with a little challenge where the winner takes all. The challenge was to make sketches into the dirt, and see who would be the first to complete a drawing of a snake. Everyone agreed. One member was especially fast, he snatched his trophy wine and bragged to the others, "I was so fast, I even have time to draw feet for the snake." With that said, he picked up his drawing stick and added little feet to his already complete snake. At this moment, another member of the family finished his artwork, grabbed the bottle of wine from the first winner and declared, "Snakes don't even have legs! That's completely unnecessary, this wine is rightfully mine!" Everybody agreed with his logic. The dude who originally finished first but decided to add unnecessary legs not only failed to draw a snake, but also failed to sip that sweet sweet wine. Moral of the idiom: Don't go out of your way to do unnecessary things, it might have repercussions.